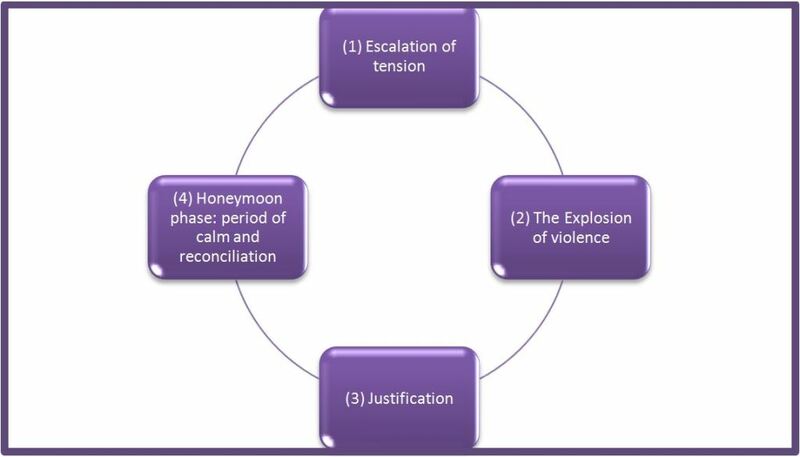 There are four phases to the cycle of violence. Each phase indicates the behaviour of the abuser and the consequences the act will have on the victim. The existence of such a cycle is more obvious when there is physical violence in the relationship, however the cycle exists regardless of the form of abuse (physical, psychological, economical, spiritual and sexual). Finally, the length and intensity of each phase differs from one relationship to the next. The cycle of violence constantly repeats itself with less time between each violent episode. Also, it is imperative to remember that the ultimate level of the cycle of violence is spousal homicide. Therefore, it is imperative to break the silence, as it is the only way to stop the cycle of violence. These incidents can range anywhere from trying to change her behaviour to glaring looks or criticisms. This last period can vary in length and may not even be present in certain relationships. However, at one point in the reconciliation phase, the violence will erupt and the cycle of violence will begin once again.